So if you also want to visit the SeaWorld and the Aquatica during your trip, the Discovery Cove entry fee allows you to visit those two other parks multiple times for up to 14 days! Not bad considering that a single entry to Aquatica is $28 for a reserved day, or $46 for any day, and single entry to SeaWorld is $80 ($65 for a weekday entry), and both parks are so much fun that you might want to go to SeaWorld at least twice during your visit, and if the weather is nice, you might go to Aquatica a few times as well. I would suggest you go to Discovery Cove on the first day of your trip, then use the passes you get there to spend the rest of your vacation at the other parks. 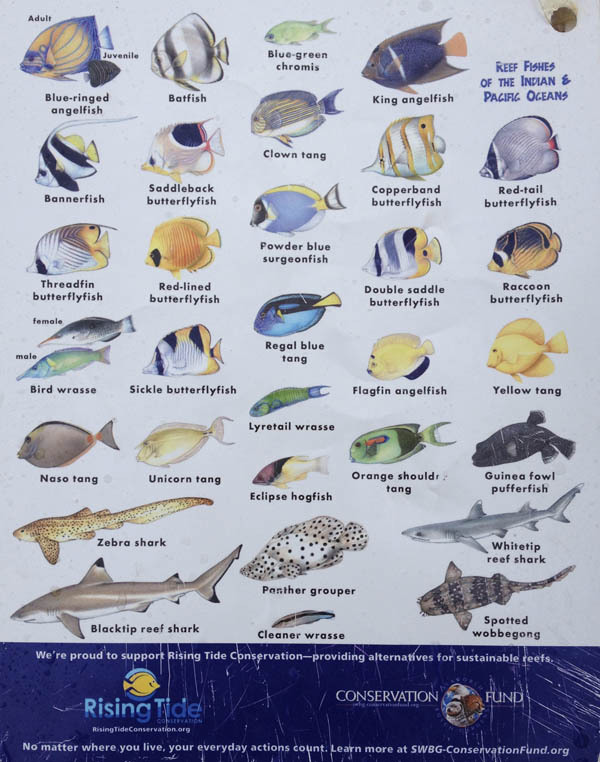 So, what can you do at the Discovery Cove? I’d say the two main attractions at the Discovery Cove are The Grand Reef and “Swimming with the Dolphins,” but the Wind-away River is lots of fun as well. 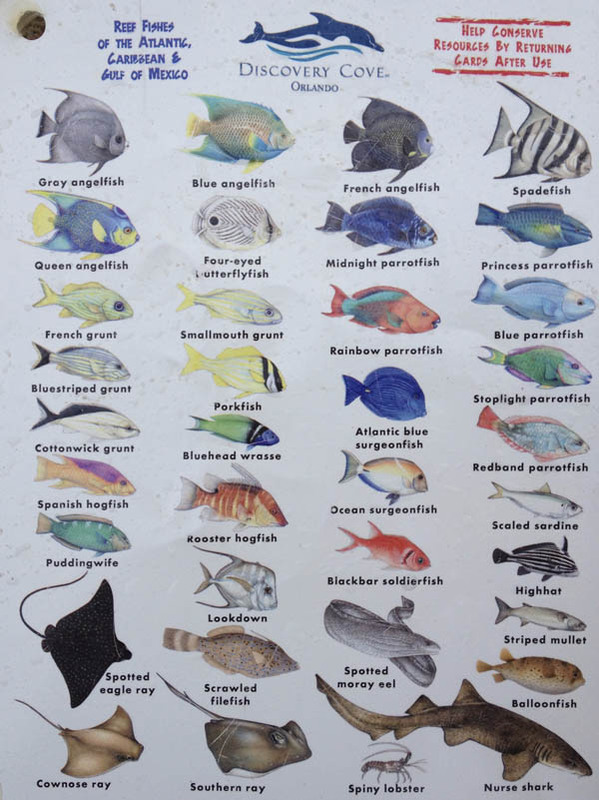 I bet few visitors to the Grand Reef page on the Discovery Cove’s site, guess that “Play hide-and-seek with thousands of beautiful fish” means you get to swim in the same area as the fish! and can watch them through snorkeling goggles provided by Discovery Cove. 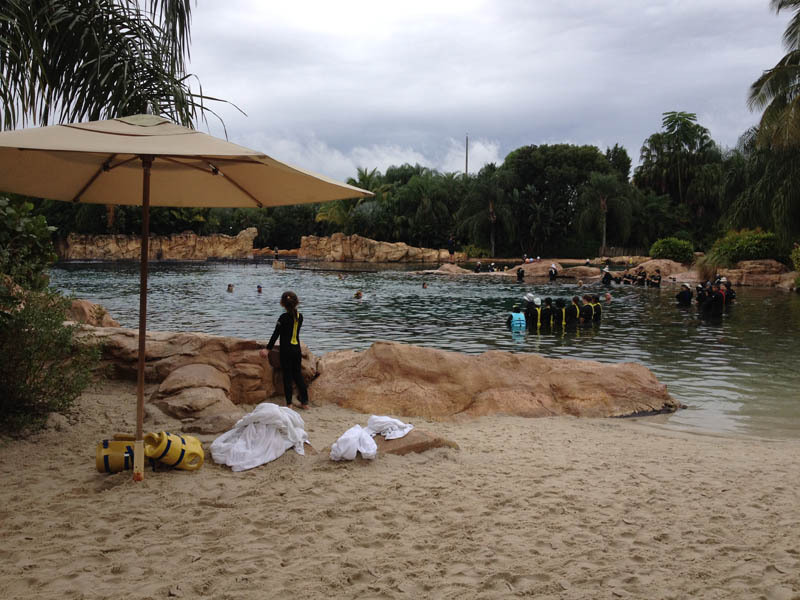 From the pretend beach, covered with fine, white sand, Discovery Cove looks just like a small swimming area surrounded by rocks. If you look beyond the short, shallow area, what might spark your curiosity is the number of people floating on their bellies with their faces in the water. What could possibly make them do that?! You’ll find out once you follow their example, and put on the goggles and breathing tube of the snorkeling set you picked up (free of charge) on your way to the Discovery Cove (located at the very end of the park). Dozens, if not hundreds of colorful fish swim underneath you in this man-made coral reef. The view is breathtaking, and after a few swims back and forth to familiarize yourself with the whole area, which is not that big, you too will want to just float and let your eyes follow this fish or another, and marvel at their beauty and closeness. The area is deep but narrow, so the fish are unable to run away from you and hide. Actually, they seem quite unafraid of humans, and will swim by very close. If you happen to be at the Grand Reef during feeding time you may also get to see the stingrays nearly climbing the feeder’s back. Seeing their strange “faces” stick out of the water like that is quite a sight. As I mentioned, the “swimming with the Dolphins” option costs extra, but you don’t have to pay for the interactive experience, unless you do want to touch the dolphins, kiss them, and let them pull you through water. If you’re happy just watching, you can watch the “performance” from the shore – a few dolphins jump quite high, and even from the sidelines you can see how well trained those animals are, sometimes splashing the group with his tail at the trainer’s command, sometimes doing the “mermaid dance” (lifting themselves upright up above water and propelling backward with a tail). If you do want to participate, when you arrive at Discovery Cove you will be given a time when you’re expected to be at the orientation tent, where you’ll watch a brief video about the dolphins and you’ll be told by the guide how you’re expected to behave while in the water, so as not to scare the dolphins or get injured. Then your whole group will get into the water (like in the picture at the beginning of this post), watching a brief “performance,” and take turns patting the dolphin, and swim with it, which basically means that you’ll be asked to grab as tight as you can the dolphin’s dorsal (back) fin and a flipper and let it pull you through water. There will be a professional photographer in the water with the group, taking photos of you patting the dolphin or swimming with it, and you can buy those before you leave. They are pricey, but they are high quality, and a nice memory to have. Of course, if you do have someone with a high quality zoom lens camera on the shore, you might as well skip the expense. Your choice. Is it worth the price? Well, to me it wasn’t, but to my daughter, who loves, loves, loves dolphins it was simply an amazing experience. The Wind-away River is basically a very long lazy river that winds in between rock walls, by the beach, and through artificial caves. May not sound exciting, but it’s actually quite fun bobbing in the water (with or without a swim vest) and let the water push you along. If you don’t trust your swimming skills, you can grab a life vest from one of the several racks with life vests throughout Discovery Cove. It’s actually more fun that way. 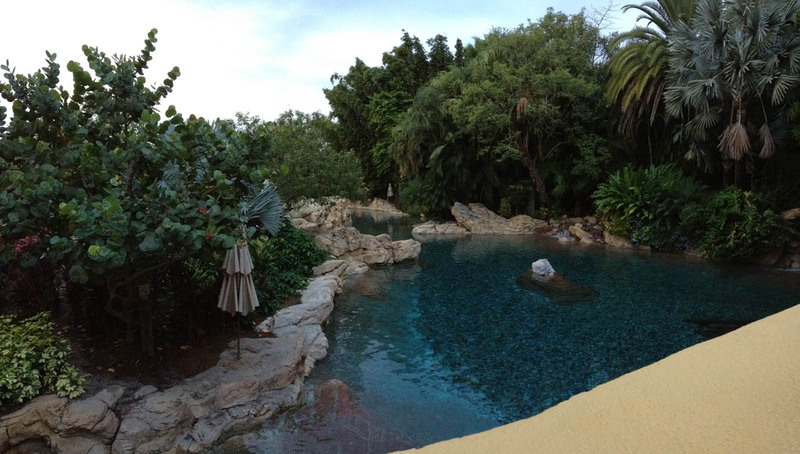 The Discovery Cove opens at 8am and the check-in begins at 7:30am. If you want to be there the moment they open, that means you need to get up rather early. 2. Reserve the tickets online, ahead of time. Yes, you can buy the tickets at the entrance, but only if Discovery Cove isn’t already sold out. They limit the number of visitors per day, so in popular vacation times you run the risk of not being able to get in the day you want to get in. 3. If you bought the “swim with dolphins” option, get to Discovery Cove as early as you can. Because “swim with dolphins” times are assigned at first-come first-serve basis, so if you show up late, it might turn out that you have to wait till late in the day to swim with the dolphins, and if there’s a storm, with lightning, they will ask everyone to get out of the water and they’ll push “swimming with the dolphins” till later. If your swim is scheduled for late in the day, you risk running out of time. 4. Find the wet suit stand and get wet suits for the whole family. 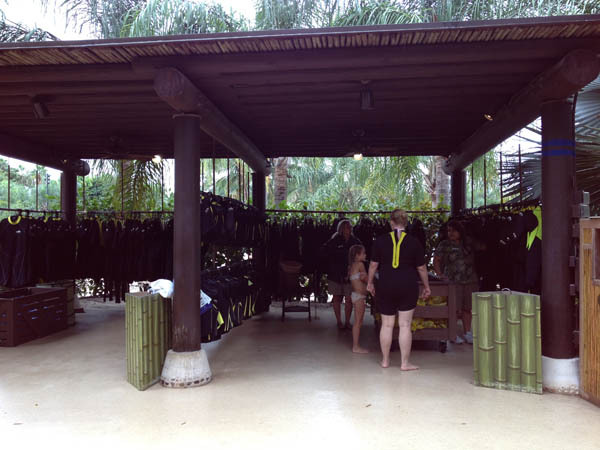 Discovery Cove lends wet vests and wet suits to the visitors free of charge. They come in all, and I mean all, sizes, but I would suggest you grab one your size as soon as you’re done with your breakfast. If it’s the middle of the summer and it’s very hot, you may think you’ll be all right swimming just in your swimsuit, but Discovery Cove actually prefers that you do wear one of their wet suits. And after a whole day in water you will get a bit chilly, so get yourself at least a short-sleeve, short-legs one. The wet vest won’t really provide a whole lot of warmth. If it’s warm, but not very hot, do get your kids long-sleeve, long-legs wet suits. You don’t want them to get hypothermia. They’ll have much more fun if they’re not shivering from cold. By the way, do use the bathroom just before you get in the water, and if you feel you need to go again, get out of the water right away, because getting the wet suits off is a bit tricky and takes a bit of wiggling. The best way is to just peel it off yourself (or your child), letting the sleeves turn inside out. You can straighten them out when you decide to put them back on. 5. Bring as little as possible. 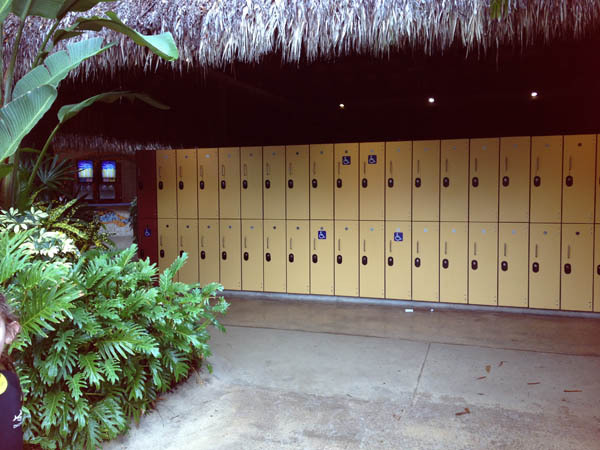 There are lockers at the Discovery Cove where you can put away your regular clothes and your valuables, but they’re not especially big, so bring as little as possible. 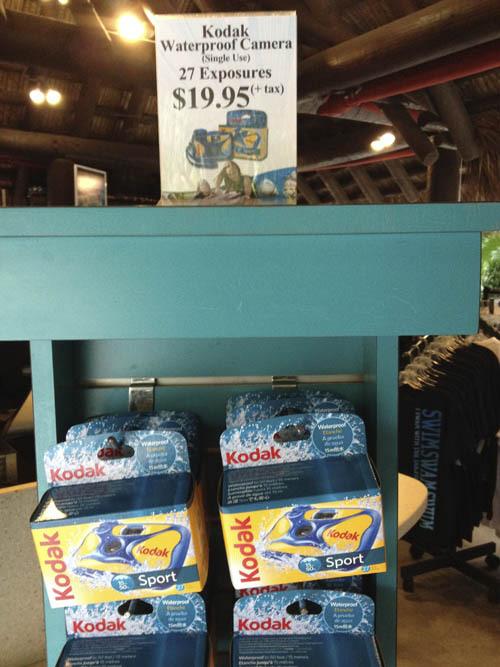 In fact, besides the wallet, your keys, and a water-proof camera, you don’t really need anything else, because Discovery Cove provides towels and swim vests as well. 6. Do bring your own water-proof camera. Yes, you can buy water-proof cameras on site, but look at the price. Best bring your own. You will definitely want to take photos under water when you swim in the Grand Reef. I did not have a waterproof camera, and decided not to spend the money on the disposable one, so I have very few photos from Discovery Cove. Do NOT repeat my mistake! You will want to take photos, believe me. 6. Walk barefoot or bring water shoes. If you brought flip flops you won’t want them in the water, because you might lose them, and because you often get out of the water at a different place than you got in, you’ll have to go back to where you got in to get your shoes. We ended up walking barefoot, but you do have to make sure you don’t slip if you walk or rocks or the cement. If you don’t like walking barefoot, you might want to wear water shoes that won’t fall off. 7. Don’t lose the photo ID they give you! The photo ID you get at the entrance is your ticket that you’ll need at the buffet and to go “swimming with the dolphins.” It will also be your ticket if you want to go to SeaWorld and Aquatica. So don’t lose it! Other than that, the buffet food is nothing special but it’s decent. It’s not self-serve, you are given a plate with food, but if you’re still hungry, you can always go back for more. There’s no limit of how many times you go back for more. That about covers it, I think. I hope you found it useful. Have fun at the Discovery Cove! We did! The time we visited Discovery Cove and SeaWorld (read our “Shark Eggs and Sea Dragons or #TravelSchooling at SeaWorld” post), we stayed at the Marriott Cypress Harbour Vacation Club property, located at 11251 Harbour Villa Rd, Orlando, FL 32821, very close to both parks. You don’t have to stay at that place, of course. There are PLENTY of hotels, apartments, resorts, and vacation homes in Orlando, FL where you can stay. Take your pick! Flying to Orlando International Airport (MCO)? Holy Moly, these are great tips- detailed enough to follow, and still enjoyable to read. Definitely got me interested, and I’ll check back often to see what else you crazy kids have been exploring! Thanks, Kym! I’m glad you like these posts. I’ll be working on describing the rest of our journeys over the last two years. Fab tips ! Just thought I’d mention you used to be able to get a parking pass from discovery Cove think it was approx $40 which covers Seaworld, Busch Gardens and Aquatic for the 14 days !!! My advice is to go and get it ONLY at discovery cove (in the afternoon preferably avoiding guest registration) before any visit to the parks mentioned . I had no idea the Discovery Cove admission price included the other parks. I’ll definitely keep this in mind for my next trip to Florida, which will hopefully be in March.